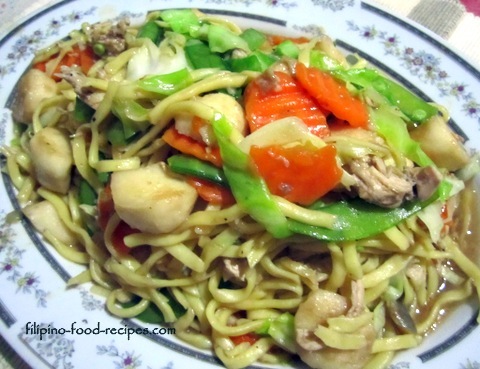 Miki guisado is another variation of the pancit or noodle dishes in Manila. It is basically cooked the same way as rice noodles or bihon and pancit canton or lo mein. Miki are fresh noodles, they are quite salty and can easily get mushy because they are already par-cooked. Depending on where you live (in Manila), the pancit miki in our wet market is called “pancit medium”, the large one for “lomi”, while the thin one is for “mami”. We either wash the miki in running water or dip very briefly or in just a couple of seconds in hot boiling water to rinse off some of the salt. 1 Wash the Miki noodles in running water, then strain and set aside. 2 Saute the garlic and onion in oil, then add the chicken breast and squid balls, season with soy sauce. 3 Add the carrots and snow peas and half the water, let it cook for a minute. 4 Put in the rest of the water, chicken cube and miki noodles, cooke for another minute or until sauce thickens a bit. 5 Stir in the cabbage and season with pepper. 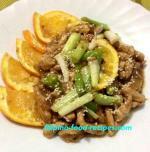 6 Transfer on a serving place and serve with calamansi or lime wedges on the side.